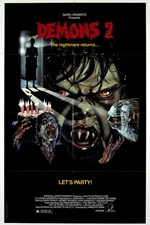 Demons 2 is a 1986 Italian horror film directed by Lamberto Bava and co-written and produced by Dario Argento. It is a sequel to Bava's 1985 film Demons and stars David Edwin Knight, Nancy Brilli, Coralina Cataldi-Tassoni as well as Argento's youngest daughter, Asia Argento, in her debut film performance at age 10. The film was also known as Demons 2: The Nightmare Returns.